For hobbyist, ceramist, auto, cycle customizing buffs. 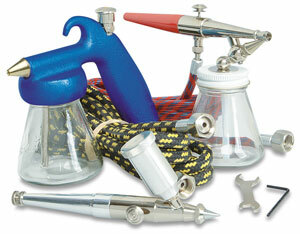 Sprays glazes, fixatives, medium lacquers, varnishes, and enamels. Flow Pencil draws lines on horizontal surfaces, making dots, and filling grooves. Has H-3 sprayer.